The game of Omweso is the traditional national game played in Uganda. 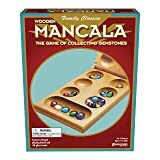 It classified as a Mancala game, being based on rules of 'count and capture'. 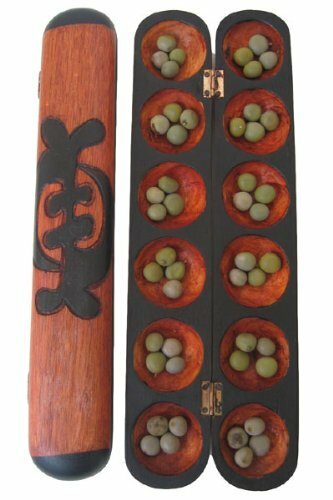 The game is played on a board with 4 rows of 8 holes with 64 black 'empiki' seeds divided 32 to each of the two players. The seeds are kept in play throughout each game, and not removed from play as in some other, simpler forms of Mancala. The board appears similar to that of the Swahili/Zanzibarian game of Bao, but the rules are very different. A Bao board has round holes apart from the 5th hole on the inner row on each side which are square, representing the 'house' of each player. But the Ugandan 'Omweso' has all 32 holes the same size and shape. Having checked that the correct number of seeds is present, the board can be setup in many different combinations, depending on the choice of the players. Before I can describe the rules of the game, I wish to introduce a notation which will act as a shorthand for describing the initial placement of seeds, and the subsequent play. I will refer to the player controlling 'A' to 'P' as "Upper" and the player controlling 'a' to 'p' as "Lower". The players divide the seeds into the holes in the rows nearest themselves to check the correct number of seeds are present before the games starts (i.e. 32 seeds each). The notation for this initial checking position shown above is therefore "4i-p; 4I-P" indicating 4 seeds in holes i to p, and 4 in holes I-P.
9a,3b,4d-fhm; 4A-F,3G,5P (i.e. Lower has placed 9 seeds in a, 3 in b and 4 in all the holes from d through to f, 4 in h and the other 4 in m. Upper has placed 4 each in A through to F, 3 in G and the remaining 5 in P). Lower starts the game and scoops up the 4 seeds in d, and sows them anti-clockwise, one into each hole as follows: c, b, a and the last into i. That is the end of Lower's turn since the last seed fell into an empty hole i. Upper decides to play from F, so he scoops up the 4 seeds and sows them anti-clockwise, one into each hole as follows: E, D, C, with the last falling into B. Since B was not empty, Upper's turn does not end: he scoops up the 5 seeds in B (4 plus the one that he just dropped in) and continues anti-clockwise sowing one stone into A, I, J, K, and the final seed into L. This is known as 'relay' sowing. This is the end of Upper's turn. Wherever a pair of holes in the front and back are occupied they may be captured by the opponent. This means that some of Upper's seeds are now vulnerable to capture: namely those in AI, CK and DL. So Lower chooses to play the 4 seeds from m. He sows them into n,o,p and the last one into h. Since the last seed fell into h, and he already had seeds there, then he captures Upper's vulnerable seeds in A and I. He takes these 6 seeds and sows them anti-clockwise from the hole from which he scooped the capturing seeds (i.e. from m). He sows the 6 captured seeds one into each hole as follows: n, o, p, h, g, f. He has now captured C and K. He takes these 6 captured seeds and plays them again from m, one seed each into n, o, p, h, g, f. 'f' now has 6 seeds which Lower picks up and as a 'relay' move sows them into e, d, c, b, a and i. 'i' has 2 seeds now, which are sown into j and k to finish Lower's turn. This was a particularly devastating attack on Upper, who cannot easily retaliate since none of his seeds can land in occupied holes opposite Lower's vulnerable pairs (bj, ck, go or hp). But Upper can capture with D, J2xh and the game continues. The most interesting rule in Omweso is the reverse capture rule where a player can choose to sow clockwise but only to make a capture directly from his left-most 4 holes (i.e. a, b, i or j for Lower or A, B, I or J for Upper). Lower can choose to reverse capture by playing the 3 seeds from i clockwise round to c to capture the 2 seeds in FN. He can then play these 2 captured seeds by normal (anti-clockwise) play into jk and end his turn, or he can decide to reverse capture again by playing the 2 captured seeds into a and b, capturing the 4 seeds in G and O. We can note this reverse in the following notation i3xF - the 3 seeds in i reverse capture F and N.
Emitwe-Ebiri - Double headed knockout or 'cutting off at the head'. A capture is made of opponent's holes a&i and h&p (the 'heads' of the board)in the same move.